Q. How much water do landscapes use in California? A. Landscape irrigation accounts for only about 9% of total statewide developed water use, but the percentage varies widely among communities. Water applied to landscapes is estimated to account for about 50% of residential water consumption statewide, but the amount varies from about 30% in some coastal communities to 60% or more in many inland suburban communities. Q. What are some easy things I can do to save water in a landscape? A. Check the irrigation system regularly for leaks as well as physical and operational problems that reduce the efficiency and function of sprinklers, drip emitters, and other water delivery devices. Correcting these problems can reduce water use by 10% or more, improve the uniformity of water application, and likely improve the health of plantings. Check that automatic valves are functioning and repair any leaks at valves, spray heads, and other connections. Walk through an area while the irrigation system is running and repair or replace sprinklers or other types of emitters that are broken, sunken, crooked, or clogged with soil or debris. Also, be certain that plants are not blocking or interfering with a sprinkler’s spray pattern, that roots are not clogging drip emitters, and that all sprinklers and emitters are of the same manufacturer and model. For sprinkler systems, ensure the spray or streams completely overlap among the sprinklers by adjusting their output or adding sprinklers. Q. Does a landscape have to be re-planted with specific drought resistant, native, or California Friendly plants to save significant amounts of water? A. No. Field research studies indicate that traditionally used landscape trees, shrubs, and groundcovers have considerable drought resistance and perform acceptably with about 40% to 60% of the water required to maintain the average lawn in good condition. This is comparable to the water required by so-called drought resistant, California Friendly, and native plants to perform acceptably in landscapes. The common perception is that plants traditionally grown in landscapes are not drought resistant, so they are usually over watered. Highly drought-resistant plants can survive extended periods with no precipitation or irrigation, but this does not mean they can provide acceptable landscape function and performance with no water. Some California native plants used for landscaping originate in the relatively cool, moist climate of the coast or in foothill and mountain climates, making them susceptible to summer drought and prone to injury when grown in warmer and drier areas of the state if summer irrigation is not provided. 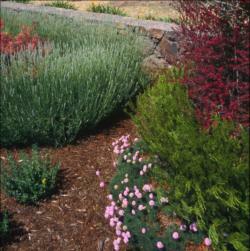 No native or commonly used landscape plant is drought-resistant until it becomes established. All plants require a steady supply of moisture for about one year or more after they are first planted. Once non-turf landscape plants have well developed root systems, they typically perform well with limited summer water. Q. If water becomes severely restricted, how should priorities be set to save landscape plants? A. Cease irrigating low-priority plant beds and lawn areas, and direct available water to higher priority and more valuable plantings, especially trees and shrubs. When water is limited, most people choose to water fruit trees, landscape trees, groundcovers, shrubs, and herbaceous perennials. Lawns and bedding plants can be re-established relatively quickly and inexpensively, but trees, shrubs and other plants need years to mature and are less easily replaced. Under-watered fruit trees probably will produce less if any fruit, but will survive. Q. How much water can be saved by removing a lawn? Replacing a lawn with a mix of trees, shrubs, groundcovers, vines, and herbaceous perennial plants that creates a nearly complete, well-performing plant canopy over the landscape can be expected to have 50% less water demand than a cool-season lawn or at least 30% less than a warm-season lawn, assuming the lawn was watered to perform well and the new planting is well-designed with a highly efficient and well-managed irrigation system. Larger water savings can be realized if cool-season grass (such as tall fescue) is replaced with mulch and a few widely-spaced, if any, drip irrigated woody plants. However, there are significant functional, aesthetic, and maintenance differences between fully and sparsely planted landscapes that must be considered before choosing a lawn removal and replacement strategy. Q. Will lawns or landscapes suffer if they are not irrigated every day in the summer? A. No established lawn or landscape requires daily summer irrigation except in a few extremely hot inland and desert areas that also have sandy or decomposed granite soils. Only newly planted lawns and landscape plants are likely to be damaged by not receiving daily summer irrigation. Tall fescue lawns perform well when irrigated 2 to 4 times per week in the summer, while bermudagrass and other warm-season lawns can be irrigated less frequently. Trees, shrubs, and groundcovers perform well when irrigated every 5 to 10 days, and sometimes less frequently. Q. What is the best approach for conserving water in a lawn or landscape? A. After doing the simple things outlined in the first question, increase a lawn’s drought resistance by setting the mowing height to at least 3 inches for tall fescue and other cool-season grasses and to at least 1½ inches for bermudagrass and other warm-season grasses. Lightly fertilize lawns but do not fertilize trees and shrubs. Limit pruning of trees and shrubs to remove dead or damaged branches and perform routine hedge trimming less frequently. Check that the majority of plants' root systems are wetted at each irrigation (6-12 inches deep for tall fescue, 12-24 inches deep for woody plants) and adjust runtimes and start times so that enough water is applied to accomplish this. Next, reduce irrigation from optimum levels by extending the interval between waterings by one day or more rather than reducing the runtime and keeping the same irrigation interval. After extending the interval between irrigations, the water budgeting or seasonal adjust feature found on many controllers can be used to fine tune runtimes and achieve optimum water conservation. If additional water conservation is needed, then further extend the interval between waterings, allow lawn areas to temporarily go dormant or die, or reduce the amount of lawn. If maximum water savings are needed permanently, decrease the area devoted to landscape and garden plants of any kind. Q. How deeply should I water my lawn and landscape plants? A. Apply enough water at each irrigation to wet the soil to the depth of plants’ root systems. Tall fescue lawns normally have roots 6 to 12 inches deep while roots of bermudagrass and other warm-season grasses are normally at least 12 inches deep. The majority of roots of trees, shrubs, and groundcovers are normally found within 12 to 24 inches of the soil surface. Ideally the soil is wetted to these depths each time irrigation occurs. Using sprinklers to fully wet the soil to these depths without creating runoff or puddling of water will usually require scheduling multiple, relatively short irrigation cycles of 5 to 10 minutes or so on each irrigation day, depending on slope, soil type, output of the irrigation system, and how much water is needed. Be certain the irrigation system is functioning well and water is applied uniformly over the area. Using low-output precision sprinklers can reduce runoff but runtimes need to nearly double in order to deliver the same volume of water as standard sprinklers. For non-turf plants, a drip irrigation system set to irrigate two or more cycles per irrigation day can be used to slowly apply water deeply without runoff. Q. How much can irrigation be reduced without hurting a lawn? A. It depends on the species of grass that dominates the lawn and the amount of water currently being applied to it. Always gradually reduce the amount of water applied by extending the interval between thorough irrigations as described above. If the lawn is primarily tall fescue or another cool-season grass and it is being well watered with no obvious drought symptoms or brown areas, then the amount of water can probably be reduced by 10-20% without seriously injuring it. If the lawn is predominantly bermudagrass or another warm-season grass and you are keeping it well watered, you can probably reduce the amount of water up to 30% without seriously hurting it. You may see brown areas develop over time after reducing water by the amounts suggested. Limited brown areas that develop when water is reduced are often signs that the irrigation system distributes water unevenly rather than because the amount of water isn't enough to meet the lawn’s needs. See the answer to the first question to address this problem. If the lawn already has brown areas from too little water, then reducing the amount of water further may permanently damage it. Further water reductions will cause the grass to be largely brown and simply surviving in a mostly dormant state producing minimal growth and soil cover. Q. How much can irrigation be reduced without hurting trees, shrubs, and other landscape plants? A. As with lawns, it depends on the amount of water currently being applied. Plantings that have been maintained with high soil moisture content can usually maintain acceptable performance with a 20-40% reduction in irrigation by extending the interval between thorough irrigations as described above. Additional 10-20% irrigation reductions to theses plantings or to plantings that have already been irrigated below optimum will usually allow plants to remain functional, but they will grow less, possibly wilt and drop some leaves. It is important to gradually reduce water over a few to several week period by extending the interval between irrigations and applying enough water to wet most of the root system at each watering. A few deep, root-zone wetting irrigations spaced 3 to 6 weeks apart from spring through fall can be enough to keep most trees and shrubs alive when water is in short supply. Many tree and shrub species will drop leaves, wilt, or suffer dieback of some branches under severe water shortage, but will survive. Q. When is the best time of day to irrigate? A. Irrigating during the very early morning hours is best with spray and similar overhead irrigation systems, generally between 12:00 A.M. and 6:00 A.M. Evaporation is lower and usually there is little or no wind to disrupt the pattern of sprinklers during these hours. In addition, water pressure is more favorable for irrigation systems in many areas during this period. Drip irrigation can be scheduled any time of day since evaporation and wind are not concerns with this type of system. Nighttime watering in California does not normally cause greater incidence of plant disease because the humidity is relatively low. Contrary to common belief, midday irrigation does not harm plants. Q. How long will it take a lawn to die from lack of water? A. If you stop watering a lawn, it will gradually turn brown signifying it has died or become dormant. Depending on weather conditions, this may take from 1 to 4 weeks for most lawn grasses, but it might take longer for deep-rooted grasses like bermudagrass. The first signs of inadequate water will be wilting of grass blades and a bluish-gray appearance. Next, leaf blades will yellow and eventually become brown and the grass will thin out. The lawn will probably not turn from a uniform green to a uniform brown, but will instead have a mix of green, yellowish, and brown areas. A lawn that recently turned brown from drought can often be revived with regular, thorough watering. Q. When should trees, shrubs, and other landscape plants be planted in a dry year or if drought is expected? A. Hold off planting until fall or winter to take advantage of cool weather as well as fall and winter rains. The planting site may be prepared in spring or summer, however. Q. How often should newly planted trees and shrubs be watered? A. The root balls of newly planted trees and shrubs need to be kept moist until a network of roots grows out into native soil. Newly planted container plants may need watering every day for several weeks during warm weather. Adding a 2 to 4 inch thick layer of mulch reduces water loss and weed problems. Delaying planting until the fall or winter can reduce the frequency of irrigation required to maintain moisture in the root balls of new transplants and takes advantage of seasonal rain. Q. If a lawn dies, or is damaged due to drought, when should it be replanted? A. Do not replant a lawn until there is enough water available from rainfall, irrigation, or a combination of the two. Assuming water is available, the best time of year to plant lawns is in the fall or spring for cool-season turfgrasses (tall fescue, rye, etc.) and late-spring or summer for warm-season turfgrasses (bermuda, zoysia, St. Augustine). Q. Will adding soil amendments like polymers or similar “water conserving” products really conserve water? A. Polymers and similarly promoted soil amendment products do not by themselves save water. They often can increase the amount of water a soil can hold, but plants still require the same amount of water. Adding these types of amendments to a soil can extend the length of time required between irrigations but will not alter significantly the amount of water used by plants. Field research studies with polymers suggest that they can extend the time between waterings, but effectiveness varies with the product, the concentration added to soil, and site conditions. Some lose their effectiveness when fertilizers and other natural salts are present in the soil. When using a polymer or other soil amendment product, add enough to effectively amend the soil to the depth where most of the plants’ roots are and mix it evenly into the soil. A large volume of product may be required to increase significantly the soil’s water holding ability especially where relatively deep-rooted plants like trees and shrubs are grown. These products provide little benefit in soils with high clay or high organic matter content.